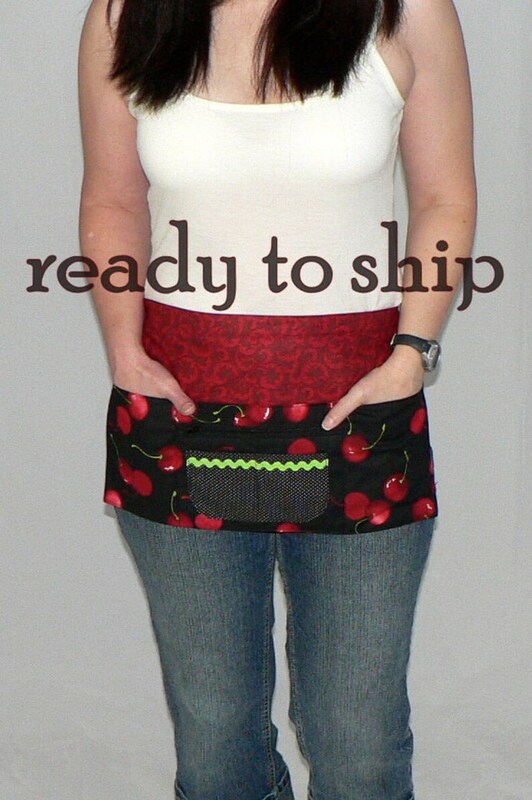 Sweet Cherry Multi-Pocket Apron: Whether you are sewing, crafting, teaching, gardening, or having a garage sale-- this handy apron holds everything you need right at your fingertips. Works great for vendors too: to hold your receipt book, business cards, pen, cell phone, money.... while keeping your hands free. (What a relief to no longer have to keep your eyes on the cash box!) 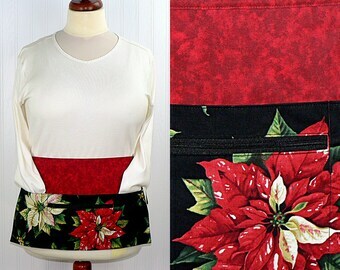 Apron features 3 large open pockets to hold your tools of the trade in this lovely large cherry print-- PLUS the center open pocket also contains an additional zipper compartment (zipper opening measures 7.5 inches wide.) 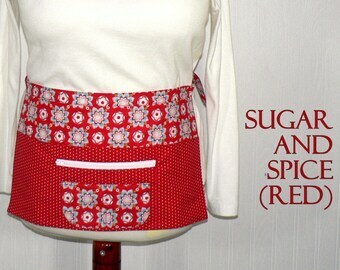 This handy apron also includes a smaller patch pocket in a coordinating color-- divided into 2 sections perfect for holding your business cards and small gadget! 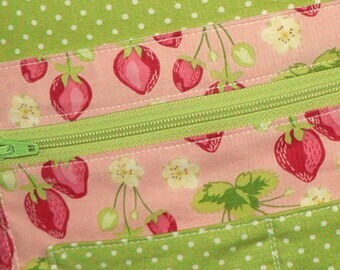 Lovely large cherries on a black background is the OUT OF PRINT "Sweet Cherry" by Alexander Henry fabrics which is RARE and impossible to find. 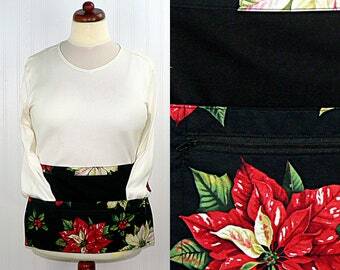 A very limited number of aprons was made using this print, and this apron cannot be customized OR made in the larger size. 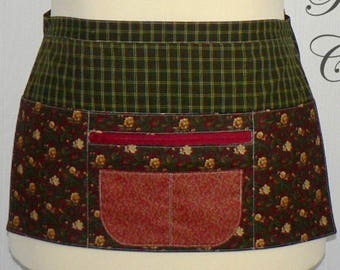 Apron measures approximately 10.5 inches tall x 17.5 inches wide. 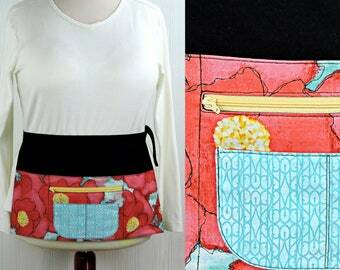 Belt with D-ring closure is adjustable to fit waists UP TO 40 INCHES. (Shown above on a Womens SIZE MEDIUM live model.) 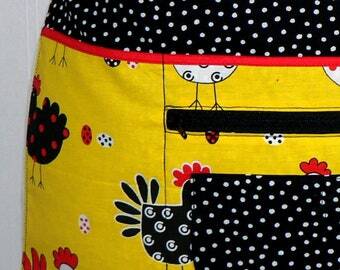 As always, my aprons are made with great attention to detail. 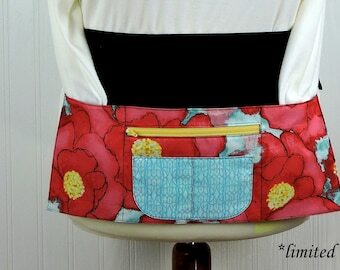 There are no exposed seams or raw edges showing for a much sturdier and longer lasting product. Every section is fully lined, and all seams are neatly top stitched.